I’ve helped several people lately who are in the process of cleaning up a mess they’ve created in Lightroom or just making some small improvements to their Lightroom catalog like moving files around to free up hard drive space. If you’re a seasoned Lightroom user or a Lightroom newbie, here a few of my favorite tips for doing a little “spring cleaning” on your Lightroom catalog and hard drive to get better organized. This is a great time of year to be doing this. While you’re cleaning out the physical stuff around the house, it’s also a great time to clean out and organize your digital storage systems. Organizing where you store your images will save you a lot of time in the long run, because you won’t be searching for files scattered all over and you will know right where to put new images when you import them. There are two main steps to this process: figuring out a logical location and folder structure for your images, and then actually moving the images to the correct new locations. One thing I recommend is keeping all your photos in one or two primary top-level folders. Most of my RAW images are in a folder called PHOTOS on my D drive (a second internal drive I use for file storage) with subfolders per year for personal photos and separate subfolders named “CLIENTS” and “MOBILE” photos. I also have an external storage device for archiving older photos with a main folder and then subfolders for each year. Having photos scattered across different folders and drives causes a lot of confusion and general disarray, so organizing strategy is to create a single top-level folder on a large storage drive for all your images and move your photos there. Be sure this drive has ample room for your growing photo storage needs. Within the top-level folder (called PHOTOS or something similar), I recommend using years as subfolders so that you can easily collapse previous years. I go even further and use subfolders for years, then months, then days (for example, “D:/PHOTOS/2017/2017-01 January/2017-01-01”). Lightroom can create this structure on import for you, and it works for me, but you may not need that deep of a structure. For most photo re-organizing, I recommend moving all your images and image folders in Lightroom. Then Lightroom won’t have those dreaded ? symbols when it doesn’t know where your photos are. The only exception is if you are moving a large folder, especially from one drive to another (such as moving a big folder of photos from your primary drive to an EHD). The easiest way to move a single large folder is to move the folder in Windows Explorer or Finder (on Mac). I recommend moving, not copying, the files so that you don’t end up with duplicates that later need to be deleted. If you are moving images to another physical drive, there is an extra step you need to take to prevent the files from being copied. To move a folder to a new drive using Windows Explorer, right-click and drag the top-level folder to the new location. Then select “Move” when prompted. To move a folder to a new drive using Mac’s Finder, hold down the Command (⌘) key, then drag the files to the new location. Once you move the folder to the new location, go to the folder in Lightroom and you will see the ? symbol next to the folder because it won’t know where that folder is anymore. Just right-click the folder name and select “Find Missing Folder”, and then point it to the new location of the folder on your EHD. When you first started using Lightroom, you may not have known a good place to store your catalog. If your Lightroom catalog isn’t where you’d like it, it’s very easy to move. If you’re not sure where your catalog is stored, you can check this location by going to File > Catalog Settings and then looking at the “Location” on the General tab. I like keeping my LR catalog in the default location, which is in the Pictures folder on my primary hard drive, in a subfolder called Lightroom. To move your catalog, you need to close Lightroom. Once it’s completely closed, use Windows Explorer or Finder (on Mac) to navigate to the location you confirmed in the Catalog Settings. Then move the file with the ending .lrcat to a new location. If you’re moving your working catalog, you should also move the folders (Windows) or files (Mac) with the same name but ending in “Smart Previews” and “Previews”. If you’re moving an old catalog as a backup, you can delete the folders (Windows) or files (Mac) with the same name but ending in “Smart Previews” and “Previews”. These previews take up space and aren’t necessary for a backup. They can be rebuilt if needed – Lightroom will just be slower while the previews are being generated. If you’re moving to a new physical drive, make sure you are moving (not copying) the files/folders to a new drive. On Windows, right-click and drag the file/folders, then choose Move. On Mac, hold down the Command (⌘) key, then drag the files to the new location. When Lightroom is upgraded to a new version, sometimes it is necessary to upgrade your catalog. This process is typically seamless, and your upgraded catalog won’t look any different. But it will have a new name. When Lightroom upgrades a catalog, it actually makes a copy before it does the catalog upgrade, so the newly upgraded catalog will have a -2 at the end. After a few upgrades, this can get confusing, so I like to go rename the old and new catalogs after this to make it clear. I recommend making sure your Lightroom catalog file is named something logical so that you always know you’re opening the correct catalog. For example, after a catalog upgrade, I rename the old catalog something like “Lightroom – final LR5 catalog” then I move it to the folder with the rest of your Lightroom backups. When you first started using Lightroom, you may not have understood how to name your catalog. Or if you’ve upgraded a few times, it could have a bunch of extensions to the catalog name (like -2-2-2). If your catalog has a long or confusing name, I recommend renaming your catalog to something simple logical like “LRCC Catalog” or something similar. If you create separate catalogs per year or have separate personal and client catalogs, you could name your catalogs something like LRCC_Personal or LRCC_2017. To rename a catalog, close Lightroom. Then navigate to the catalog in Windows Explorer or Finder (on Mac). Rename the .lrcat file as appropriate, then rename the Previews.lrdata and Smart Previews.lrdata folders (Windows) or files (Mac) in the exact same way. See example below. If you are following my advice about using one Lightroom catalog, and have multiple Lightroom catalogs you want to combine into one, you can easily import a catalog into another catalog. In Lightroom, open the catalog that you want to use as your primary catalog. Go to File > Import from catalog. Navigate to the folder containing the other catalog(s) that you want to import. Select a catalog to import. Wait while LR analyzes the catalog. This may take a while. Select the folders from the old catalog that you want to add (usually this will be All Folders unless you know you only want to add one or more specific folders of images to the main catalog). Under New Photos, select “Add new photos without moving”. Under Changed Photos, select Replace “Metadata and develop settings only” and select the “Preserve old settings as a virtual copy” checkbox. Under Existing Photos that are Missing, select the “Update metadata and develop settings” and “Preserve old settings as a virtual copy” checkboxes. Click Import. The import will take a while, but shouldn’t need further input from you. 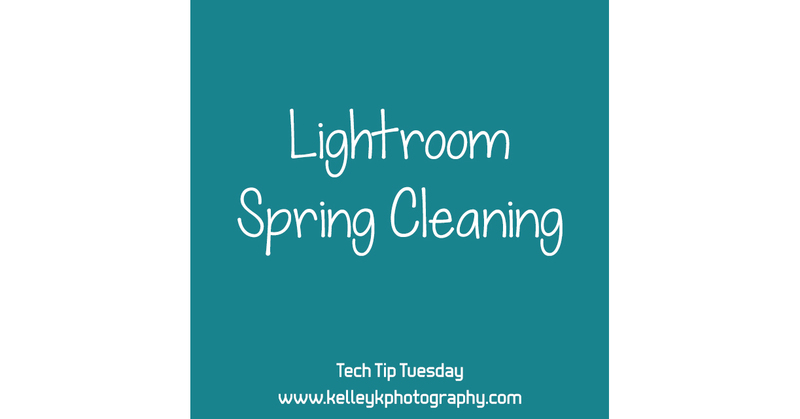 Your Lightroom should be working like a well-oiled machine after some spring cleaning and organizing! Your workflow should go a lot smoother when you know where all your files are located and have a consistent location where new photos should be imported. If you need more hands on help with moving files or managing your Lightroom catalog situation, I am available for mentoring / consulting, either over the phone/web or in person (if you’re in the Atlanta area).